There is no perfect family. We are all works in progress. This book is a must read for anyone searching for answers to the family happiness puzzle, which in many ways is all of us. It serves as a guide to find the “sticky glue” that supports the family bond, to enhance the family’s spirit and energy and to deepen connections across the family network, which is today refreshingly diverse in membership and structure. Every family has some degree of imbalance, some more than others, and every reader of this book can gain a clearer picture of how to nurture happiness, care for a family’s soul and, just as importantly, engage and encourage other family members in this quest. The exercises and tools are practical, accessible and easy to implement. The author weaves together dozens of colorful, funny and tender anecdotes that surfaced in her research, with illustrations that capture their spirit and theme. Written with empathy and good humor, the inspiring ideas and tips found here will motivate you to listen selflessly, speak from the heart, and practice whooping and praising descriptively—starting now! "This book will help American families—in all their beautiful and diverse forms—thrive and prosper in the ever-changing landscape of today. 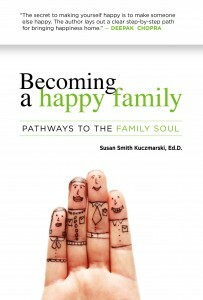 In embracing the uniqueness of modern families, Dr. Kuczmarski powerfully navigates the truths that define family life for us all: insecurity and confidence, doubt and courage, empathy and love."